TO DO individual justice to all eight contributors to this volume would require more space than I have at my disposal. All have subscribed to a convincing rejoinder to RTÉ's The Killings at Coolacrease in its Hidden History series. That programme's producer/director Niamh Sammon, is quoted as saying that she was inspired by a "slim volume" by William Stanley I Met Murder on the Way. Stanley was, in turn, inspired by Dr Peter Hart's The I.R.A. and Its Enemies. Published in 1998. Dr Hart's work was challenged by Nial Meehan and Brian Murphy in Troubled History (Aubane Historical Society, 2008). Briefly, the programme alleged that the departure of one Protestant family, Pearsons of Coolacrease, constituted "ethnic cleansing" - a nauseating racist euphemism. It was further contended that the Pearsons' neighbours coveted their farm and planned a "land grab". The family left Ireland, and were generously compensated by Free State and British governments. Neither was the Coolacrease incident, as Eoghan Harris (Sunday Independent, 9 October 2007) described it, "an appalling atrocity". The Cromwellian clearances; the Holocaust, the events in disintegrating Yugoslavia and the Rwanda massacre were appalling atrocities. 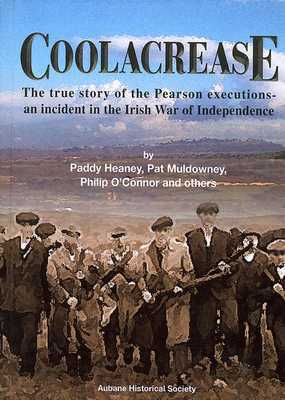 At Coolacrease, the Pearson brothers attacked the IRA, wounding two of its men and a passerby. The IRA investigated the shooting. It found that three brothers had participated and condemned them to be shot by firing squad. Two brothers were executed, in what appears to have been a botched operation. In line with official British reprisal policy, the Pearson home was burnt. The foreword to this book firmly places the incident in perspective: - it "was not 'hidden' in any sense. It was not known nationally, but was long-known and well-known in the locality." In 2000 Paddy Heaney published its history in Under Slieve Bloom. The work under review provides a wealth of documentary support in the form of official government (Irish and British) records, newspaper extracts, private correspondence, photographs and maps, all accompanied by supporting notes. Many of these sources were available to the authors of RTÉ's The Killings at Coolacrease. Dr Pat Muldowney undertook a painstaking analysis of the script of the broadcast, which resulted in more than sixty-six criticisms (not all are numbered). This alone should have delivered the coup de grace. Six individuals, including contributors to this book, protested to the Irish Broadcast Complaints Commission (BCC) under The Broadcasting Act 2001, "Section 24(2)(a) (fairness, objectivity & impartiality in current affairs)." The response: "the programme dealt with an event that took place 86 years ago, and was not the subject of current political debate until after the broadcast", was valid. The complaints were not within the scope of the BCC. "The broadcaster/ independent producer has editorial independence and decides what material to include in its programming." The BCC decisions probably lent a spurious authority to the broadcast. "In the long run a harmful truth is better than a useful lie". This document was last modified by David Granville on 2009-08-31 19:57:24.